As an assembler and integrator in the aerospace gearbox industry we pride ourselves on our manufacture and assembly of production gearboxes. 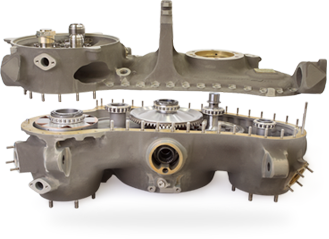 Complete gearbox assemblies provide the essentials to fixed wing aircraft, supplying air, fuel and electronics to the aircraft, as well as providing lift capability for helicopters, through the power transmissions and tail rotors. A wide variety of Aero Gear assemblies are on commercial and military aircraft across the world. Aerospace gearboxes are the “brains” of the power system and demand the highest quality precision engineering and manufacturing. At Aero Gear we have repeatedly proven ourselves as a leading manufacturer of complex gearbox assemblies for the global aerospace market. Our people are the engine that drives aero gear’s continuous pursuit of excellence. TODAY, TOMORROW, AND IN THE FUTURE.